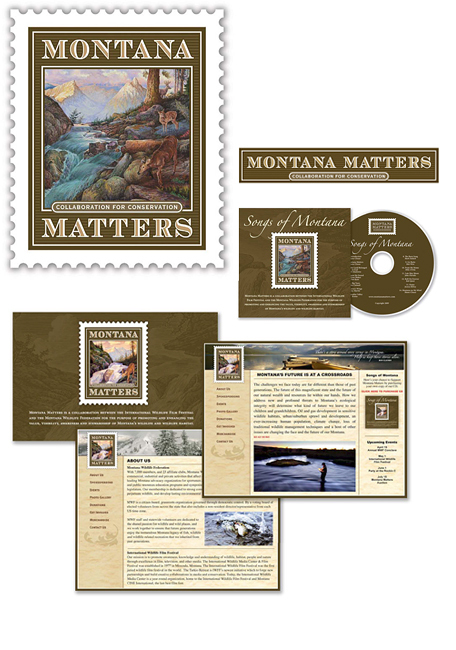 Montana Matters is a collaboration between the Montana Wildlife Federation and other conservation organizations for the purpose of promoting and enhancing the value, visibility, awareness and stewardship of Montana’s wildlife and wildlife habitat. After developing a comprehensive brand platform and finalizing the brand name, the new identity was created by working closely with noted wildlife artist, Sven Lindauer. The new brand was transformed into a complete design system including a website, CD cover, poster, brochure, posters and merchandise. Montana Matters was launched at the MWF convention in Helena, Montana on April 18, 2009 when Governor Brian Schweitzer stood in front of hunters, anglers, conservationists and outdoor enthusiasts stating that this campaign will have multiple benefits for Montana, by connecting the world to the “Treasure State” and generate support for conserving fish, wildlife, and habitat.